Is This The Name Of The Bizarre New James Bond Racer? 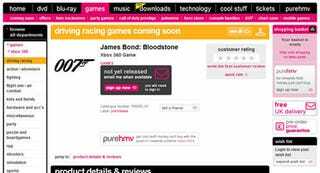 Has British retailer HMV beaten Activision to the punch, revealing the name for Bizarre Creations new James Bond racing game to be James Bond: Bloodstone? Strategy Informer stumbled across this listing on High Street retailer HMV's website for James Bond: Bloodstone, a driving/racing game for the Xbox 360, Nintendo Wii, and PlayStation 3. Could this be the official name of Bizarre Creations' latest creation? I'd say it's likely. The delayed title isn't tied to any of the Bond movies, to the point where the company hired a completely new actor - UK soap star Adam Croasdell - the play the part of the titular secret agent. Plus, retailers are known for making up release dates, but generally don't make up video game titles. We've pinged Activision for comment on the name, and will update should we receive a response. Whatever the name, we expect to see more of the new James Bond racing game come E3 in June.